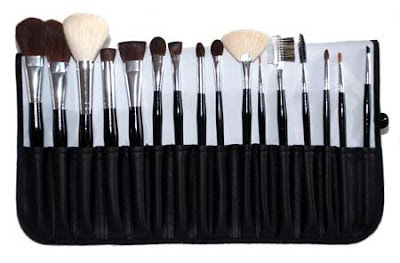 Makeup is only as good as the tools you use so it pays to have a good set of sturdy brushes in your makeup bag. Many make up artists have paid through the nose for their equipment but you need not spend a fortune to get a few essential tools every woman should have. There are many brushes companies tell you that you must have, but I’ve narrowed down the essential ones I have in my own makeup bag to ensure seamless application of your slap. Large and medium sized rounded eye shadow brushes. These are an absolute must as they allow you to blend colors effectively and because they’re round they shape around the contour of your eye. You want these brushes soft, not square and hard. A good one I have is by Ruby & Millie and it’s priced at only £9.50 from Boots. When you want a good finish to get rid of those pesky under eye circles, it’s best not to apply it with your fingertips as the skin under your eye is very delicate. It’s worth investing in a good concealer brush as it’s a must for anyone that’s serious about makeup. I have a great one by a company called Prescriptives and you can get it online for around £15.00. A must for applying creamy foundation. This gives a better finish than using your fingers or a sponge and is also great for highlighting/contouring. Foundation brushes can be very expensive, but it’s worth investing in one if you want a great finish. Clinique do a great one for £20.00 at Debenhams, but it looks beautiful in your makeup case and feels amazing on the skin! A great investment. You can get these rather cheaply, and it’s great for getting a good lip line rather than relying on the lipstick itself. Pick these up for under £5.00 at any Superdrug. This brush is a great investment if you love your eye colors as it allows you to apply shadows in all areas of the eye, seamlessly and precisely. I never bother with the makeup brushes you get in palette eye shadows as I find these aren’t very accurate. Ruby and Mille do a great one for less than £7.00 at Boots. It’s also great for filling in eyebrows if yours need some help! A makeup kit without one of these large, full brushes is not complete. It allows you to apply and blend your blusher or bronzer evenly. Get a natural brush instead of a synthetic one as not only does it feel nicer, I find the distribution to be more even. Nature’s Mineral’s blusher brush, at £14.00, is a bit pricey but worth it as it fits neatly into your makeup bag as it’s so compact! A great tool you can use to comb and shape your brows. You can pick these up in Boots or Superdrug for next to nothing! You can mix or match these depending on what kind of make-up you use, how much you’re willing to spend and what works for you. Just don’t forget to clean them regularly! i'd definitely recommend giving the elf brushes a try!